56 Houses, starting October 9, 2007. This is where I grew up… and over the past decade, a little bit is erased away each day. It used to not have much significance in my life. After all, I knew this would come… ‘they’ have been talking about it ever since the early 90s. Even then, even when they took my friends’ houses, or the house where my cousins lived, or my teacher’s house… I was still too young to grasp it… too young to sit up and pay attention…. to care. It wasn’t until I saw the wrecking crew blow through my old bedroom on October 24th, 2006 when finally it all came slamming into my face- this place, this land was all I ever really known. My house, my friends’ and my families’ homes, my sidewalks, pools, parks, churches, schools, businesses… everything… gone. Soon, I will never be able to come back to this place again. If I have kids, I will never be able to show them where I came from. They will never know the place where I once played… the place where I once dreamed of one day leaving… This place that now I come back to wonder what exactly happened… and why. This place was once a subdivision called Carrollton, located in Bridgeton, MO. It was one of the first planned communities in the U.S. that made sure to include green space, parks, schools, churches, and a community center in its development. Lambert International Airport made a proposal to the city of St. Louis to expand beyond its boundaries and build a new runway. This was pushed because, at the time, St. Louis was a hub for TWA. Despite the fledgling airline industry, the cause for eminent domain was issued in the direction of Bridgeton, including much of the city and all of the Carrollton subdivision. Although fought hard by community residents who formed a group called, “The Bridgeton Air Defense” and a number of legal battles that stretched decades, Lambert ultimately won and started taking homes as early as 1992. 2,000 structures, 2,000 parcels of land have become or will be soon property of Lambert International. For almost 5 years, every tree in our subdivision was tied with yellow ribbons to show solidarity against the large airport. This gesture was to demonstrate how we were being taken hostage. As a kid, I really thought somehow the little guys would win and we all would get to stay. To a kid, it didn’t make any sense for someone who didn’t want to move to be forced out of their home, and there were a LOT of people who did not want to move. As I got older, school became more important than little issues like bureaucracy, even if it meant my mom’s house at stake. By the time I was old enough to realize that the concrete was creeping in to the edge of the subdivision where we lived… it was too late to care. Or, so I thought, until last year. Watching my own house go down, I realized that the remaining homes needed to be documented too. So, for the past year, I have been watching and photographing what little remains of the original 2,000. As of today, October 9th, 2007… only 56 houses are left. So, this is their stories… along with the stories of the houses that went down since my own. I don’t think I will ever understand why an entire community was torn apart for an airport that lost its hub status only a few years into the expansion plan… and for new runway that is only being used 5% of the time. What I do understand is the human tendency to hang on to the past, even if only fragile tangible fragments are left. Once the 56 are gone… it will be time to move on. I really like the last line you wrote there. It’s startlingly true. This has been the most fascinating and tragic discovery I have made in recent memory. I cannot thank you enough for your documentation on this. I grew up in Maryland Heights, and my parents had several friends who lived in Carrollton. Being only 24 now, I barely remember the yellow ribbons and talk of airport expansion, as our friends were some of the first to relocate in the mid 90’s. I recently found myself at the entrance to Carrollton, and I recalled all of the controversy. Driving through what is left filled me with such sadness and reawakened what few memories I had of this forsaken existence. I am grateful for your photos, and especially for your eloquent prose. I think that we ought to try and get Sufjan Stevens to make an album about it…. It’s right up his alley. Ahh… now how do we get Surfjan to take note? : ) That would be amazing! I have always wondered how the younger generation (you’re 6 years younger than I) handled the buyout. I moved out when I went to college as well as all my friends, so we weren’t around during the main activity. It was only during occasional weekends home that we noticed, “hey- so and so’s old house is gone.” The younger Carrollton kids who were still going to school during this whole thing were losing friends left and right- not to mention having their own schools torn down and kids relocating to different elementary schools. Imagine being the only kid left on your street for a year or more. Thank you Zach for your input! Anyone have a take on this? Heck, if he’s planning on doing a Missouri album, then this WILL be on it. I’ll see to it personally. What struck me most about Carrollton – and what intensified my emotional response – was just how similar (even identical) it was in layout and architecture to the home I am still able to visit. My parents live in Wildflower subdivision in Maryland Heights, and most of my friends lived in Seven Pines or Old Farm Estates. If you ever visit these areas (especially Old Farm) you will note the similarities. I cannot begin to fathom what goes on in the mind of an adolescent when the place that they call home – the only source of stability – is slowly eroded in such a grotesque manner. Your site, photos and prose has me on a memory roller coaster. I don’t know how else to express what I’m feeling right now. I moved to Carrollton as a young boy in February 1960 and left for Texas, to strike out on my own, in April, 1974. I need to sit back and digest things now. I grew up in Carrollton on Weskan Lane from the time I was 6 until I moved into my first apartment 14 years later. I also had a fantastic childhood due in large measure to this planned community. Our family had a great deal of adversity due to my father’s illness at a young age. Yet despite extremely low income I was able to play tennis, swim, go to community day camp and blend with a host of professional and blue collar families. My 3 sisters and I have all obtained college and advanced degrees and live very good lives. With the advent of Facebook opening to us older populations, I was given this website by my friend Gayle. Thanks so much for doing this and I plan to be back to visit. Thank you for preserving the history of Carrollton. I really love your work and photography. I lived on Cypress Rd in St. Ann (PHS class of ’77) and many of my friends lived in Carrollton. Larry Hulsey, Mike Dew, Rick Wilson, Roger Pipes, Dawn Millfelt, Mark Young. After joining the USAF I would stop by the Carrolton Club for a beer with the buddies still living there. My friend Bob Cline lived on Primghar up until the end, the tri level house where Cardinal Orlando Cepeda once lived. I still can’t believe Carrollton is gone. I lived on Selwyn lane also, from 1962-1965. I remember the Deans and the Dews!. I think the Drummonds and the Raya’s lived on my street too. I lived on Selwyn Lane from 1961 until I left for college in 1978 and later bought the house from my Mom and lived there from 1995 until the buyout. I remember all the names you mention. I am thankful to God, that as if this date, my family has not suffered any illnesses in regards to the Bridgeton landfill. I just found this blog and I just found out Carrollton was completely demolished. It made my cry. I was born and raised in St. Louis and my grandparents built a house in Carrollton, paid it off and lived their until their deaths. Several aunts and uncles did as well. I have fond memories of the pool and the neighborhood and the sense of community. I knew they were buying up the houses close to the airport, but I went away to college in ’96 and never really went back. Imagine my surprise today when I went to look for my grandparents’ house on Google Earth and… nothing. I can’t wait to read this blog and reminisce. Thank you for chronicling this for those of us coming a little late to the party. I had the similar experience with google earth – they just erased the places where most of my childhood happened. We left Carrolton in 1971 close to the end of fifth grade for me at Bonfils Elementary. The kids I can remember: Steve Schulte (lived next door) Earl Dillard, Brad Plamp, Jim Davis, George Kunkel, endless first names. Mr Waters was my fifth grade teacher, Mrs. Schwartz my 4th. There were TONS of kids. We messed around in creeks and farmers fields right outside the neighborhood. Played in the new construction after school and during the summers. Was in Cubscouts and Webelos there – Earl Dilllard’s mom we our den mother. I’d especially love to hear about Earl Dillard if anyone knows anything about him. It was 40 years ago for me. Wild to think that it’s gone. I think another house I lived in is gone too – Fox Hill Drive behind the Seminary. Can’t find it on Google maps… Everything changes. Do you know of any pics from the home at 4245 Carrolton DR.? 12721 Ellsinore Drive, Hazelwood class of 72, sister Jamie. Mom was one of the last, she passed on 2 weeks prior to the Airport contacting her about selling. She so wanted to move but there was no cooperation from the Airport Authority. I moved out all of her belongings, and sold the house. I consider myself fortunate to have been able to grow up there……from 1963 till I moved away after high school in 1973. I have some photos of the construction of the house and some when I moved my Mom’s stuff out…will try to get them posted. My sister, Roxie, and I knew you and Jamie! We lived at 12648 Turon Ct, on the corner right across from the Carrollton pool. We lived there from 1965 until my parents moved to Lake St Louis in the early ’80s. Are you guys on Facebook? Hi Cindy…Yes I remember Roxie…hope she is well…..had a huge crush on her….Jamie lives in Jacksonville Florida with her son….. I live in Defiance with 71 Hazelwood Alum, Denise Merrell Shoop……. It was a great ride, Carrollton……sad for sure. Possibly will see Roxie at the next reunion….Big 40! I was born on Lonsdale in 1960. I agree that this was a very special and unique place to grow up. There is a group of us from the Lonsdale, Weskan and Woodford Way area that get tegether for drinks to discuss old times every summer now. It is amazing how successful kids from there are. Our small group had three attorneys, a major bus dealer, a medical doctor, a real big shot engineer in management at Boeing, the owner/editor of a major magazine and a SLU professor. It seems bizarre to me that now all the houses are gone the city spends so much money taking care of all that landscaping. It is regularly mowed and they even weed-whack around all the trees. Funny thing is I go there at least once a week. It is the best place in all of St. Louis to take my dogs. Although most of it is posted no trespassing, we have never seen anyone else there. It is like a giant private park and we can just let those bird dogs burn. Mike, when you were a kid did you have blond hair and glasses? I was in Mr Waters class in 5th grade at Bonfils. Mrs Schwartz in 4th. Another kid that I remember was George Kunkel. I lived next door to Steve Schulte on Woodford Way. I was born 60 and started first grade at Bonfils. Left at the end of 5th grade. I noticed that any comment negative towards the actual building of the subdivision is conveniently deleted/hidden and/or dismissed. Since the beginning of the site, I have posted every comment that has ever been left, so long as it wasn’t spam. The reason you don’t see any negative posts is because this site has been traditionally found by people that want to look up information about Carrollton/Bridgeton for historic or nostalgic purposes. Most people who don’t care about Carrollton’s former existence do not tend to google it. Congratulations on being my blog’s first negative comment. My family arrived in Carrolton in 1961 and rented on Selwyn Lane before buying on Dorrance Lane. I attended PHS and attended with friends from Carrollton Jill Rowe (If anyone knows where she is now, let me know; she got married and divorced while attending Mizzou and I lost track of her.) and Sandra Weirsma. After graduating from Lindenwood College in St. Charles I taught high school for one year and then joined the military and left my parent’s home. Eventually, they moved out too. But, I was outraged when I learned from college friends that Carrollton was going to be torn down for an expansion of the airport. Now we know it was all for nothing and what a lovely community it was and remained to the end. Shameful. What a loss. My name is Steve Smiley and I lived in Carrolton Estates from 65-70 on Elsinore Drive. My age at that time was 6-11 and I had many friends there. I went to Bonfils Elementary School. Some of the kids names that were friends, George Kunkle, Richard & Tim Harig, Melissa, Debbie & Laura Morvitz. Larry Hallis & Stevie Burke. There was a helluva cave behind George Kunkles house in the hill going down to the creek. Great memories as well as sadness about how it ended up. I was there at the same time as you, except 66 – 71. Maybe in the same class at Bonfils. I remember George Kunkel, Earl Dillard, Brad Plamp and I lived next door to Steve Schulte on Woodford Way. I had Mrs. Schulz for 4th grade and Mr. Waters for 5th. I was in the Cub Scout den at Earl Dillards house. I think I remember you, but it’s been over 40 years! It was an interesting time and place to grow up. Hey all. I love reading about how everyone lived in Carollton, especially those that were there when i lived there. My house was on 14880 Parlier Drive, and we lived there from 1961 to 1972 at the end of my 8th grade year at St. Lawrence the Martyr. I have such great memories, and I am heartbroken now by what happened to our neighborhood. I lived there at a time when half of the neighborhood was being built. All I have now is memories, and I can never go back to drive around and re-live my memories. I lost a friend to cancer many years ago. I spoke with him the night before he died and he shared that it was clear to him now…”What matters in life,” he told me, “are my relationships with other people.” I’m reminded of what he said when I think of Carrollton Oaks and read about all of you and our memories and sadness about the loss of our neighborhood. I’m thankful to have each of you to share with….The Carrollton Oaks community lives on through our connections to each other. That said, I also wish we could go back, drive around and meet up with some of our old friends. Wow. Thank you for doing this. I lived a short while at 12839 Celburne Lane from 1972 (1 year old) to 1978 (7 years old). I do remember the old neighborhood, the community center, and some of my friends from those days who are now long lost. I, much to my surprise, came across the total anhilation of this subdivision recently when I pulled up the area on google maps to show my 6 year old where I lived when I was her age. I grew up from ’75-’79 at 4332 Allenhurst Drive. My parents had the house built in 1970 and adopted me in 1975….when I was 7 yrs old. I loved…loved….loved this neighborhood!!!! My parents were/ are John and Anita Paige. Some of the neighbors I remember are Jodi Willard, Jennifer Spangler, Angela Cole, Lana Lois, Michelle Waugh, Raymond ??? ?, Robby Hicks, Ploegers, Mrs. Yokel …….many names flood back. Went to Bonfils Elem until 6 th grade. We sold our house when talk started about the ‘possible’ but out/ force out and moved to St. Charles across the bridge. Our house was green then my folks painted it orange……we were jokingly known as the pumpkin house after that. As for people who might be ill……there maybe a reason…..though it may slightly taint your view a bit. Facebook pages Coldwater Creek and West Lake Landfill might be something to check out. Apparently there was a lot of dumping and contaminating basic.y in our backyards. Explains a lot of weird illnesses and unexplained things. But that is for you to decide. But I still have great memories of this childhood fun neighborhood!!! And no one can take those from me!!! Any pictures of the old house? I lived on Carrolton from 1995-2002 With my mom Jill and lil Sister Mindy. I loved exploring the neighborhood,I was 19 when I moved in but damn the neighborhood was set up so fantastically coolit was a great neighborhood and I loved to research it as much as possible I love the memories and pics I see wish i could see more pics of start of stages of compleation. Lived on Lonsdale in 73 and 74. Had Miss Schultz in 3rd grade and I think Miss Rayburn in 4th. Remember burying a time capsule in 4th grade across street from school – was supposed to be dug up in yr 2000 – anyone remember that. Went back to see the place in 2011 only to find everything gone – didn’t know anything about the airport as had moved away from MO in 77. Felt like I was in twilight zone driving down empty streets with no homes – shocking and sad! My family lived on Elsinore in Carrolton until we moved to FL in 78. I heard of the destruction of our neighborhood years ago and was heartbroken. It was a safe and wonderful place to grow up. Unfortunately, I don’t think it was probably the healthiest place to live. My father died of cancer. My brother throat cancer. My mom scleroderma, and I have an auto immune disorder. Our neighbor across the street; brain cancer. Mrs. Moran, scleroderma. Mark Sanders, brain cancer. The list goes on with infertility and other health issues. Of course we can say that in an area as big as Carrolton there’s bound to be these types of health issues; but it seems like the numbers are astronomical. Now, here’s where it gets weird. I was in town for a family gathering and a friend and I decided to take a drive out to the old neighborhood. Creepy does not even begin to explain it. Streets and side walks without houses. The yards and landscaping although overgrown was still intact. To stunned to drive beyond a crawl; we just rolled down one of the few roads still open and took it all in. At one point it was suggested we get out and walk beyond the gates to where my house once stood. But something told me that I never wanted my feet to touch that land again. As we headed back in the direction we just came from we were shocked to see another vehicle parked on the side of the road. As we approached the car we saw it had military plates. It was at this point we spotted the guy crouched down close to the ground with ear plugś in his ears taking a soil samples. He looked up at us and within a couple of minutes we noticed yet another vehicle was now following us keeping his distance and matching our pace. As we approached the bridge we watched in the rear view mirror as our chaperone stopped and turn around and went back to wherever he came from. After all this, a question keeps nagging at me. Did “they” ever really intend to utilize the land? Is it possible that the airport expansion was just a ruse? I know it sounds far fetched to suggest that they would spend a billion dollars on a runway they had no intention of ever rolling a plane down. But in the scheme of things it’s probably a lot less than compensating 6000 people for building a town on top of a toxic waste site. If you are curious…check out FB pages Coldwater creek, WESTLAKE landfill, Weldon springs…..these pages may answer some question you have as well as bring up a few more. I loved growing up there and will never forget it, but things have gone sore quickly with the area. My family rented on Selwyn and then bought on Dorrance. I plan to be back in the area for my Pattonville High School Reunion this fall. Can anyone tell me how to access / drive into what is left of Carrollton and whether it is legal to do so or considered trespassing? Hi Tricia! Bonfils at the Carrollton entrance, and Galatin, both off Natural Bridge are still accessible to Woodford Way. Woodford Way connects to Celburne and Brampton to Gist Road. Hemet Lane is also still open as Bridgeton still operates O’Connor Park. Everything else is either gated off, supposed to be gated off, or rough terrain to drive on (as Manteca). Thanks. I don’t know if I’ll be able to find my way around without the usual landmarks, but it’s worth a try. If my home on Dorrance Lane is still up I’d like to see if the dogwood is still there. I don’t know when they get seems, but I’d love to try to grow a tree from that tree. As for everyone who has gotten cancer, I do recall all the flights that went overhead and wonder if they leaked oil or fuel as they came in for landings. I lived at 12752 Woodford way. What great memories. Playing in the woods, fields and the creek. The pool, Khoury league baseball. Who else remembers when Cardinal baseball player Orlando Cepeda lived in Carrollton West? The barber shop, Telsher hardware, the bowling alley, IGA, that ice cream shop, all great memories. Billy Ekis, The Ottens, Rick Kohler, Dave Frick, Steve McCoy (we had tons of fun on his trampoline). We moved their in 1961, I-270 wasn’t even built nor was the Woodford way overpass, we had to go down, cross over the interstate construction then back up the hill to get to our house. Bonfils wasn’t even built yet when I was in first grade, I spent first grade at Garrett elementary over in Villa Marie subdivision in Hazelwood. I moved out around 1979. My parents finally sold their house in 1991. IIRC, the original expansion only had them taking out the subdivision up to one side of Chartley dr. Then it expanded and then the blockbusting started when they’d buy out a home and tear it down. I was sad to go through the last few years it was still a subdivision. Houses were let go as the inevitable was going to happen. Open lots inbetween houses. All for an airport that barely has any flights anymore. Don’t know. I also knew the Fricks (Dave was my age), they were distantly related to us. They lived across the street from the McCoys. I remember they later moved out to Lake St Louis but that would’ve been in the 80’s I’m guessing. What happened to Dave Frick I also don’t remember. He and I were pretty close back then. I lost track of a lot of people from then as the last 2 years of high school I went to North County Tech. 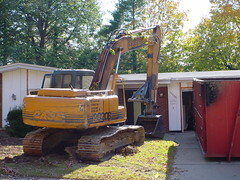 I filmed and photographed the removal of the last house in Carrollton, located on Grandin, in February of 2009. I was there two full hours before the removal and through the duration of the demolition. Those present included two officials from the airport who left during demolition, two demolition crew members, and two friends of mine who assisted me with documentation. There was nobody named Pat on-site that day, nor any police/ambulance response (which would have been the case if someone barricaded themselves inside the home prior to removal). I have archived nearly every article written about the airport and I have nothing regarding someone refusing to leave a home. If you could point me to that article, I will be more than happy to post/link it. I first saw Carrollton as an array of empty streets…Flying out on a plane bound for Minneapolis. Passing through. I saw the roads and the sidewalks. The community pool. And I knew it was a 60 s suburban neighborbood that was gone. I thought of the July 4th’s, the snowy days, smells of mown grass, the sight of neighbors driving home in their new Oldsmobiles, Buicks and the occasional “foreign job.” Enduring the ribbing by their neighbors who drove the competition. The magical light thatonly a perfect summer sunset can cast on a street with lawns filled with newly-planted trees. I think of the awkward prom photos taken in living rooms across this community. Avocado appliances. Ersatz iron railings. The sound of workaday men slamming their car doors after driving home.This all washed over me in the moments that the jet’s engine fumes washed over these streets. A few google searches and I found myself here. A reader of your account, but not a party to your pain. What a powerful account. Thank you. For reasons I cant explain, Im deeply moved. Seven yearsI have read your blog. And it moves me the same each time….to tears. Thank you for your comment and for understanding the pain of our loss. The fact that the runway we gave our homes up for isn’t even used is all the more hurtful. Why did this happen? Is there something we don’t know or was this just mismanagement or what? Tricia, I wish I had an answer… Perhaps this is a slippery slope, but St. Louis authorities dont have the best track record when it comes to big projects – the runway, Pruitt-Igoe. These projects were boondoggles for different reasons. The notion that this runway was necessary is ludicrous. The destruction of a community is an outrage. As a suburban kid Im used to seeing things built 30 years ago being razed for the next big idea. But, Ive never seen an entire community removed for any reason other than public safety (Times Beach, Mo) in all my life. My suburban upbringing is what I believe permits me to appreciate this walkabke and liveable community for what it was. This website is a treasure. Thank you. It actually had more to do with St Louis city owning the airport despite the fact it sat in St Louis county. It was a cash cow for them. Virtually every other city out there that needed to expand their airport did so by going further out. In fact, there were several plans kicked about that would’ve moved the new airport into Illinois. Yes, Lambert at the time, being a TWA hub was in desperate need of expansion. Because of the proximity of the runways to one another the airport couldn’t run at full capacity in bad weather. Because the airport was landlocked by development, a real expansion to fix the problem couldn’t happen without completely moving the airport. The city fought building a new airport tooth and nail. Bridgeton also fought this which drug it out for years despite the fact the city began blockbusting by buying homes and bulldozing them. First TWA went bankrupt and then American bought them out. Then American dropped Lambert as a hub after air traffic fell off drastically after 9-11. Now there isn’t a need but they’d already gone too far to stop. That expansion will never be paid for. The airport see’s a fraction of the air traffic it used to. That new runway is barely used. My family lived at 12782 Woodford Way on the corner lot of Woodford and Brampton. It was the house I’d been born into in 1972 and we lived there until I was 10 years old when we moved to Michigan with my father’s job. Having spent nearly half of my childhood in another neighborhood in a whole different place, I can tell you all that Carrollton was the best place to grow up ever! I too remember Bonfils School and all of the places we had the freedom to run and play and my favorite thing of all was the community pool, especially when they opened the concession stand and they sold those bars of taffy in grape and cherry! I remember my older brother and his weird friends hanging out around the sewers late at night and family walks to Dairy Queen. When we moved, absolutely nothing was the same about our new neighborhood; not even many friendly kids like in Carrollton, where you made friends wherever you went. My family had friends on Celburne with 5 kids with whom my sister and I played, but my very best friend was a girl named Mary Dawn Russell. I believe she had moved to the neighborhood from Texas and I moved a few years later. I don’t remember exactly what street she lived on, but if anyone knows anything about her, I’d love to know. I could give her my email address. And thanks so much for doing this. A number of years ago when my parents and I were visiting my brother who still lives in St. Louis, he took us to see the old neighborhood and the spot on the corner of Woodford and Brampton, once a teenage boys’ hangout, a place for couples to hold monthly Marriage Encounter meetings, a family to eat dinner around the table together every night, and a great big backyard with a swing set, a sprinkler, and a little girl without a care in the world. Sandy – my family lived at 12683 – but we moved in the spring of 1971. It’s like we’re all ghosts of the place, passing out of time, but with very similar memories. I learned to ride a two wheel bike by coasting down Brampton and hitting the tree next to our driveway… The drive way was gone in 1992, when I took my wife to see where I grew up, and the garage had been made into a bedroom. All gone now, entirely, but for memory. americanshellgame – I laughed so hard when I read your bike story because coasting down that big Brampton hill was how I learned to ride too, only mine wasn’t a two wheel bike. Mine was one of those little three-wheeled Hot Wheels! (Remember those?) In fact, we probably hit that same tree many, many times! Here’s to our skinned knees and bloody noses; but most of all, to the renewed joy to be found in sharing some of our fondest memories with Carrollton friends new and old. I think Mary Dawn Russell now Jonas lives at 1691 Florine Blvdl,; Saint Charles, MO 63303. I tried to call her number to verify it is the Mary Dawn you are seeking, but her mailbox was full. Never the less, the number is 636.240.8372. Good luck finding your dear friend. And if anyone knows what happened to my dear friend Jill Rowe who also lived in Carrollton, please let me know. I lost track of her after she went to the Mizzou school of journalism. Sandy – that’s great! Cheers! I used to live on Holmford, my house was directly across from Carrollton Oaks Elementary. I went there for Kindergarten and I remember how much I loved living there. I just wish I could go back and relive my faint memories. I wish I could still see my house. It upsets me a lot. My family lived directly across the street from Pattonville’s Carrollton Oaks Elementary School, too. We moved there in 1968, after living on Chartley (in Carrollton and attending Hazelwood’s Bonfils Elementary) from 1963 – 1968. We relocated after I stated college in 1975, with no idea of what was to happen to our beloved neighborhood. Thanks to everyone for taking the time to revisit “The Wonder Years” in Carrollton — I always tell my parents how lucky we were to grow up in such a fine community. How awesome to read these stories. I lived on Woodford Way 12676 I think from age six until we moved around age 10. Attended Bonfils walked to school. I remember airplanes at my eye level at night and the pool everyday and hand free bike rides down Brampton same bush attack lol, had stickers in it! Grape taffy and the high dive! Played outside until dark, great memories. Oh and yes Cancer survivor 12 year Lymphomia. I lived on Ralls Drive in Carrollton. I have nothing but great memories of Carrollton. Went to Carrollton Elementary in 4th, 5th and 6th grade starting 1966. I was so sad to see that Carrollton no longer exists. Most of Ralls Dr. had lots of kids and had so much fun. I lived at 14844 Phelps from 1959 until 1974. My mom stayed to July 2004. Freebourn Park was named for my dad and Mom taught music at Carrollton School. A wonderful place to grow and thrive. It is a sad place now. I ofren wondered why there apoeared to be no asbestos containment because I always knew our floors for sure were asbestos tiles. I lived on Larchburr in Carrollton from 1962 – 1968. Today my younger sister turned 50 and we took a drive to our first home. Since Larchburr was at the very end of Bonfils, it is probably under a runway. That was a great house on a great street. I remember Michael Downs, Cathy and Sharon. And the lady across the street who called my mom when I ran around with no shirt on. I found this site accidentally while looking up other things. It seemed like a very nice neighborhood to grow up in and is close to the design of the one I grew up in called Edmundson. They were both shaped like a horseshoe with their own park but yours was bigger. The person(s) that designed both places was a genius. The houses in your neighborhood where better and bigger though. A developer destroyed my neighborhood but first bought up houses all around us and let them decline until coming back and buying us out. It is sad to watch a neighborhood die but what is sadder is when the big shots start investing a lot of money in what is left because they think it is going to attract new and younger people. At the same time businesses like pawn shops, liquor stores, and loan companies move in. It happened in my old hood and it is happening all around yours…just look down the Rock Road going toward St. Ann or down Woodson Road in Woodson Terrace. Both of those communities will die soon. They have ruined my school district (Ritenour) and are pouring money into it trying to save the schools. Neighborhoods have a life cycle and finally die off. The older people pass away and the young ones leave. Here is more. My town Edmundson was right across from the airport. The planes were so loud you had to cover your ears and open your mouth to keep your ear drums from exploding. As I said earlier they let us sit there forever (10 years) before buying us out. I believe that the airport bought out a community right at the end of it a long time ago. I don’t remember the name but it was right on the other side of cypress road I think. If some of you people are going back into your old hood be very careful… there are probably nut cases hanging out in there. They should be patrolling the place from the look of the graffiti all around. There is a woman that has a blog on this subject that has been taking pictures of the houses since the beginning of the demo and probably has one or two of yours. I can’t remember the name of it but it will be in the listing of all the topics on this situation. Her name is Desi. I hope I didn’t miss any spelling errors like in my last one even though I do proofread (were instead of where). The subdivision remains are haunting, a rather distinctive kind of erasure. Thanks for setting up the site. I lived on Baskin Street (parallel to Hemet, off Woodford) starting in 1959 when my family moved to Carrollton from the City of St. Louis. My sister and I lived there until departing for college at the end of the 1960s, after which we returned from time to time. We lived on the side of the subdivision that went to Hazelwood schools. (That Hazelwood/Patterson district split divided the community.). Because Bonfils school had not been built yet, we had to commute to a grade school in Florissant. (I still get anxious thinking about our bus sliding off the high-crowned roads in winter.). I graduated Hazelwood High in 1968. My parents continued to live in the Carrollton house. My father, Bill, was active on Bridgeton’s planning board, trying to make the best of a difficult situation (I see now). At one time there was a plaque for him at city hall. After my father died in the house in 1989, my mother, Margaret, continued to live in the same house until it was acquired for demolition. It was very hard for her leave. She lived nearby in a senior home until she passed away in 2010. I have fond and sometimes poignant memories of Carrollton and everyone who lived there. It’s sad that the houses all had to be removed, yet it also makes it seems like it belonged to us who lived there and no one else.